​The Great Lakes of North America are the largest group of freshwater lakes in the world. With a surface of over 94,000 square miles, they form an elongated inland sea with waves, winds, currents, depths and distant shores. The earliest evidence of human occupation in the region is estimated at 10,000 year ago, at the end of the last ice age. *Total shoreline length is greater than the sum of the shoreline length for the lakes because it includes the connecting channels (but not the St. Lawrence River). ​Read more on the "Physical Features of the Great Lakes" from the EPA ​. What's so Great About the Great Lakes? - by Cheri Dobbs and Jennifer Gabrys. "The North American Great Lakes — Huron, Ontario, Michigan, Erie, and Superior — are so big that they border 8 states and contain 23 quadrillion liters of water. They span forest, grassland, and wetland habitats, supporting a region that’s home to 3,500 species. But how did such a vast and unique geological feature come to be?" Explore the Great Lakes by theme. You can book a Great Lakes Cruise for spring, summer or fall. Why not winter? The answer is ice. 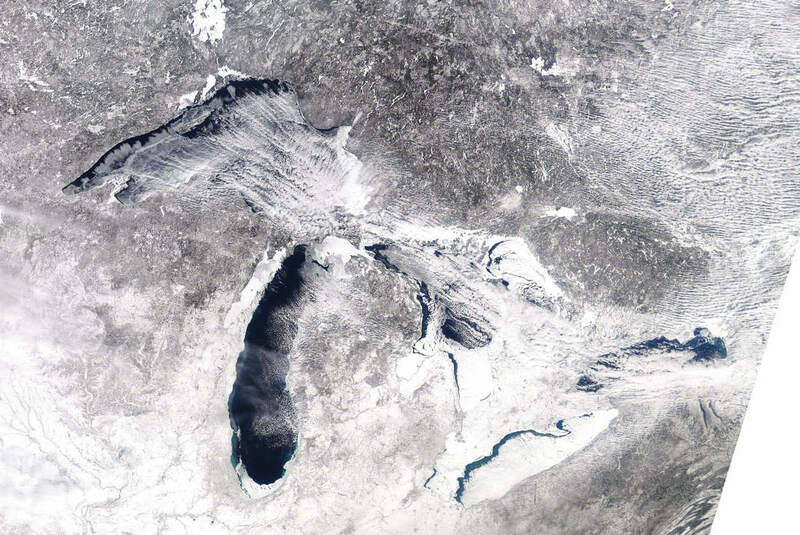 Great Lakes, February 2018, NOAA satellite. ​Check out this video tour of the Great Lakes Shoreline by RV Lifestyle. In their Great Lakes Shoreline Tour, they'll follow the coastline starting in New York state and catch the local color and natural wonders of the Great Lakes.